I don't support NYPD's turning their backs to Mayor de Blasio. What de Blasio said to his son, in view of what was happening in NYC and around the country was perfectly reasonable. I'd have said the same if I were him, and the community who voted for him, perhaps largely because of a commercial in which his son was prominently featured, needed to know that the mayor saw that. He opposed stop and frisk, ran on a platform saying so, and moved to block it. He has never said a disparaging word about NYPD. On the other hand, I've watched Rudy Giuliani say teachers don't deserve raises because they stink. This was Rudy's way of arguing for merit pay, which has been around for a hundred years and has never worked anywhere. This argument, of course, is not restricted to Giuliani, and is bandied about by politicians statewide and nationally. It's discussed in op-eds as though it's common sense. Of course, common sense is the least common of all the senses, and this sort of blather has pervaded all of MSM, up to and including the allegedly liberal New York Times. Mayor Michael Bloomberg treated us like something he had to scrape off of his Florsheims. He gave the police an 8% two year raise, and he gave FDNY and virtually every other union the same during an economic downturn. In lieu of that, he gave us a middle finger, threatened to lay us off, tried very hard to destroy our seniority rights (thought not those of any other union), and said he'd like to fire half of us and double class sizes. I don't know about you, but I've had very tough classes of 34. It's idiotic, counter-productive, and incredibly thoughtless to contemplate classes of 68 kids at a time. With the financial support of the extremely right-wing, extremely wealthy Koch Brothers, Scott Walker decimated union in Wisconsin. He eliminated collective bargaining, and made unions vote annually for dues checkoff. Of course he didn't do that for police. Michael Bloomberg famously referred to the police as his private army. And someone has to protect Walker from the crowds that surrounded his capital when they realize how badly they're being screwed. Pretty much all of the above is disparate treatment. The press regularly vilifies us. I've seen Campbell Brown and her nonsensical arguments plastered everywhere. Judging from the extremely selective stories she tells, literally based on a handful of cases, you'd think teachers were sexual predators. You'd think people like Bloomberg and his pawns ought to be able to fire us at will, based on unsubstantiated or even rejected allegations. I've read stories in the Daily News and the Post that mirrored her blather. I'm familiar with precisely one of the cases she endlessly repeats and I happen to know the teacher in question deserved nothing more than a caution to be careful of how his words can be interpreted. This is a lesson that teacher, after unmerited years in the rubber room and thousands in unnecessary fines, probably knows better than any other teacher in the city. The NYPD officer, on the other hand, was facing a man strangled to death, and on video. This was ruled a homicide. A grand jury, however, cleared the officer. I don't hear Campbell Brown loudly crying for this officer's job. I don't see articles about him in the tabloids demanding justice. And in case it isn't clear, this officer was not accused of making a distasteful statement. This officer killed someone, someone who said, "I can't breathe," eleven times, and the video is all over the internet. I would understand the cops turning their backs to the mayor on the basis of the crap contract they're being offered. My very first act of unionism was marching with UFT at a Labor Day parade in which we planned to do that to David Dinkins. We were all wearing black t-shirts that said, "Shame on City Hall" on the back. But we weren't at a funeral, and we weren't making the preposterous claim that Bill de Blasio had blood on his hands. Because our plan was no secret at all, Dinkins ran off to a tennis match somewhere rather than face us. Apparently, we are supposed to respect the authority of the police, no one may ever question the actions of a single police officer, and no one may warn their children to be careful when dealing with the police, even after we watch a man killed by a police officer on video. On the other hand it's perfectly fine to vilify teachers, to stereotype us based on shoddy evidence, and to deprive us of due process based on a handful of sensationalized cases. We should trust in the good graces of folks like Mike Bloomberg and Dennis Walcott, and we should disregard the fact that they are fanatical ideologues with no regard for evidence or truth. Is this because teaching is a profession dominated by women? Is it because time and time again our union leadership has compromised with folks like Bloomberg, embracing mayoral control, charter schools, colocations, two-tier due process, and things that looked very much like merit pay? Is it because the job of educating our children must always take second place to the importance of enriching the likes of Pearson, Eva Moskowitz and Rupert Murdoch? All of the above? No more multiple choice questions for today. Today's a day for reflection. 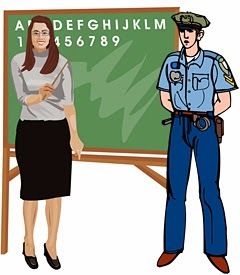 Why is there one standard for police, and a very different one for teachers? Why is it so widely accepted by the media? Is it the job of our union leadership to let the public know this? Is it possible to even do that, and if so, how?